So here I am starting my little pregnancy updates on my blog. I am feeling so lucky to have this little baby growing inside of my belly. Its all safe and cosy and growing stronger everyday. I have started to feel some little movements maybe once a day or every other day, when I sit down and really concentrate. Its so soft and gentle it makes me smile. It is truly such a special gift to carry your child and I wont ever take it for granted. I love my children and I am so thankful I have been blessed with each of them. I say it often but helping them, nurturing them, and bringing them up is truly one of my passions. I want to raise good, kind people. I think thats what this world needs. I might not always get it right and I might shout sometimes but nonetheless life is wonderful and creating life is even more magical. I am now 17 weeks and like I said previously I am going to really try to document this pregnancy on my blog as much as I can. I am also making weekly blogs of my pregnancy on my youtube channel. Our baby’s fingerprints are now fully formed and their hearing gets better everyday. Baby is about 5 inches long. Which is just amazing to me and weighs as much as a turnip. Baby’s skeleton is turing from soft cartilage to bone and the umbilical cord grows stronger and thicker everyday. We cant wait to meet you little baby. I have been in a really good mood for a while now. I have my grumpy moments but thats just me and not pregnancy related! Generally speaking I feel better and healthier then I ever have for a long time. My hair is growing so much and I feel really well. I think that has a lot to do with the sun too. I do love the sun and it makes such a difference to me. It really wakes me up. My energy levels are so good too. I am buzzing around working out of home and at home, nesting already I think as I am always cleaning. Non really. Slight frequent urination and tender breasts. Sleeping really well. Although I do wake up for the toilet a lot. Twice a night is a good night! Just recently in the last two days I have felt a little movement. Which has been amazing. Because I was beginning to worry. The movements are so gentle though it would be very easy to miss them which is why I think I hadn’t felt them yet. I am excited for them to get stronger and harder as baby grows. I have avoided tea and coffee throughout my whole pregnancy as it made me feel sick. (I love tea and coffee) and just this week I have started to enjoy a nice cup of tea again which has been lovely because I do love a cuppa in the mornings. I love egg still and enjoying avocado. And thats about it at the moment. Feeling baby very gentle hello movements in there. It was really lovely. I am so pleased. Feeling more movements and for this pregnancy to carry on as it is. I am really enjoying it and this little baby. I also cant wait for Daniel, Sophia and Archie to feel the new member of our family move. That will probably bring tears to my eyes. Aww it’s so lovely when you start feeling movements – my daughter is 7 weeks old and reading your post makes me miss being pregnant already! Helen recently posted…#LITTLELOVES: First Outfit, Maize Maze and All the Mud! Oh congratulations… I loved being pregnant. Those days are gone for me now… and it makes me sad. I might have to follow your pregnancy in lieu of having another of my own. Darling this is such a beautiful idea for a post. I felt really odd flitters around the same time, oddest feeling ever! 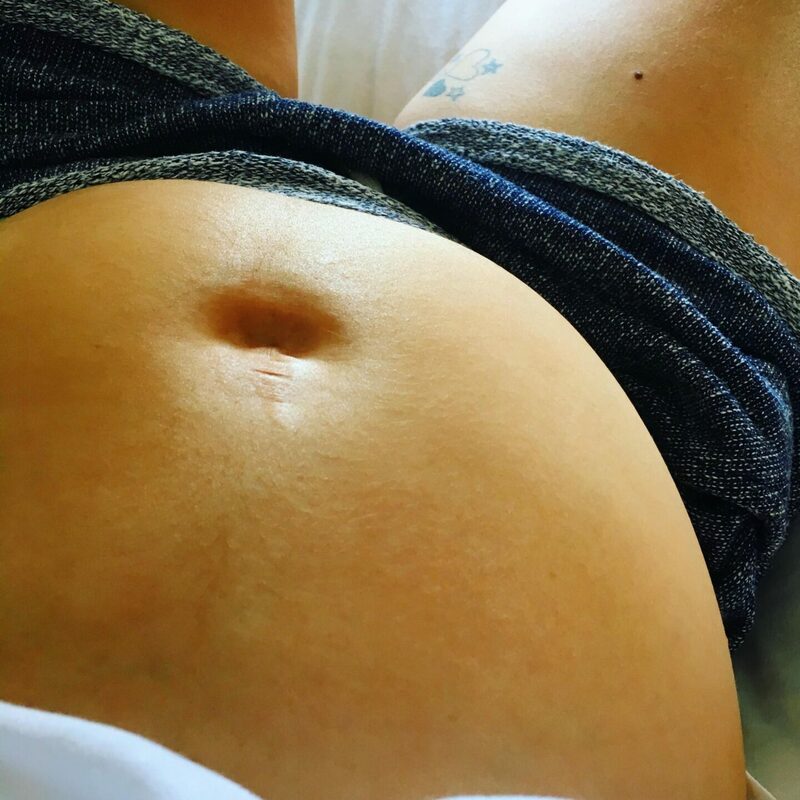 This is such a lovely post, especially as you’re in such a great place right now, after the morning sickness before everything starts to swell a little! I’ve just had my second son, 3 months ago, so I’m really starting to feel a little more like me already. And even now, I miss being pregnant! How bizarre is that I thought it would take longer to be honest. So pleased you are feeling well, you look incredible! Looking forward to reading more about it.